Do you have a little one that loves owls? Perhaps you’re looking for a sweet birthday theme for a 1 year old. The owl party theme is really popular right now and it’s great for either gender. Here I’ll provide ideas for invitations, decorations, activities, food and treat bags. All of the party printables featured here are from Just a Little Sparkle. Guess Whooo is Turning 2? We promise you’ll have a hoot at the party! Whoo is the cutest birthday boy around? Guess whooo I want to come to my party? You! To create more of an outdoor woodland look, I added some fake leaves and brown ribbon to this banner by Just a Little Sparkle. You could also include fake leaves and branches around the party table. Your local dollar store is a great place to go to find inexpensive decorations like this. Sticking with the “Whooo” theme of the party, a fun board game for the kids to play is Guess Who. You could also create your own version of the game by describing different kid-friendly celebrities and having the children guess who you are describing. For a fun craft idea, guests could create small bird houses for friends of the Owl. Thinking of food for an owl themed party can be difficult. If you want to stick with the woodland theme, you could have various snacks that resemble branches and twigs like pretzel sticks, bread sticks, spring rolls and other thin rolled appetizers. 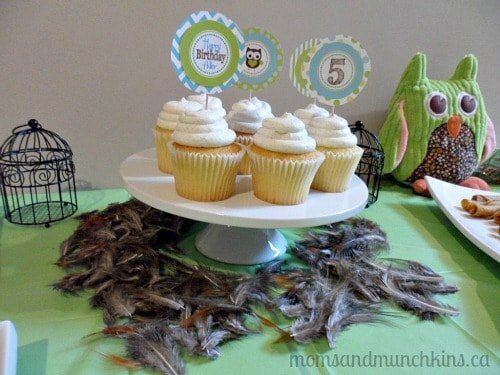 Cupcake toppers are an easy way to bring the cupcakes into your party theme. If you love baking and decorating cakes, there are also owl cake pans that will help you create the perfect owl for your party. 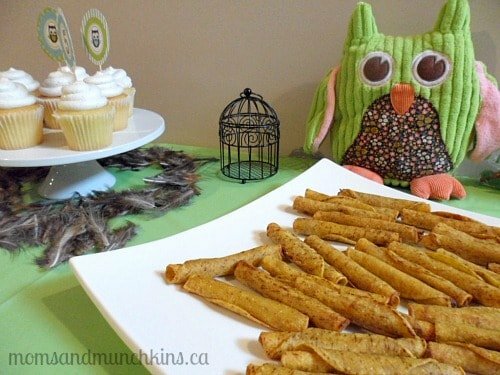 Some other fun ideas for dessert include chocolates in owl shapes and owl cookies. 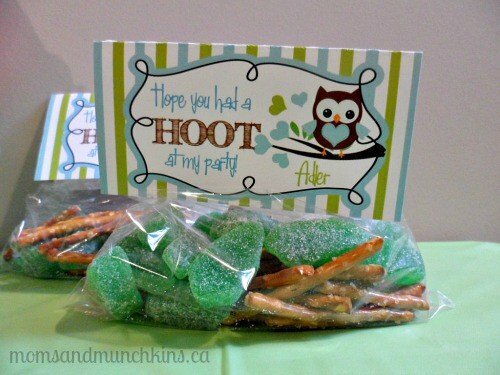 Favor ideas for an owl birthday party include stamps, stickers, change purse, candies and anything else with a cute owl print. 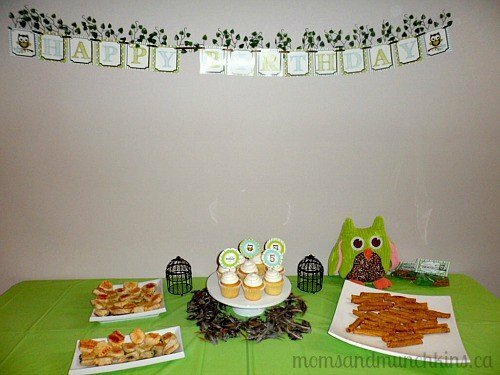 A fun treat idea are twigs and leaves (pretzel sticks and spearmint leaves) with a fun “I Hope You Had a HOOT At My Party” favor tag. Have you ever seen a real owl? We’re always adding new & creative party ideas and we want to share them with you. Follow along on Facebook, Twitter, Pinterest and Bloglovin’. *Disclosure: I am part of the Tiny Prints, Inc., Birthday in a Box, Big Dot of Happiness and Amazon affiliate programs. Just a Little Sparkle provided the printable party supplies for my use free of charge. All opinions expressed here are my own.